It’s always a bummer when you psyche yourself up for something, only to be completely depressed with the end results. This seems to happen to me far too often. Whether it is food or drinks, products or services, stuff just seems to be a bummer. I find that I get my entire mindset based on one flavor or taste and then, try the product, and am so bummed. So was the case with a new item I tried a few weeks back. While Quaker Chewy bars are pretty much the lowest quality granola bar you can get, they often times are BOGO at Publix and result in my purchasing of them. 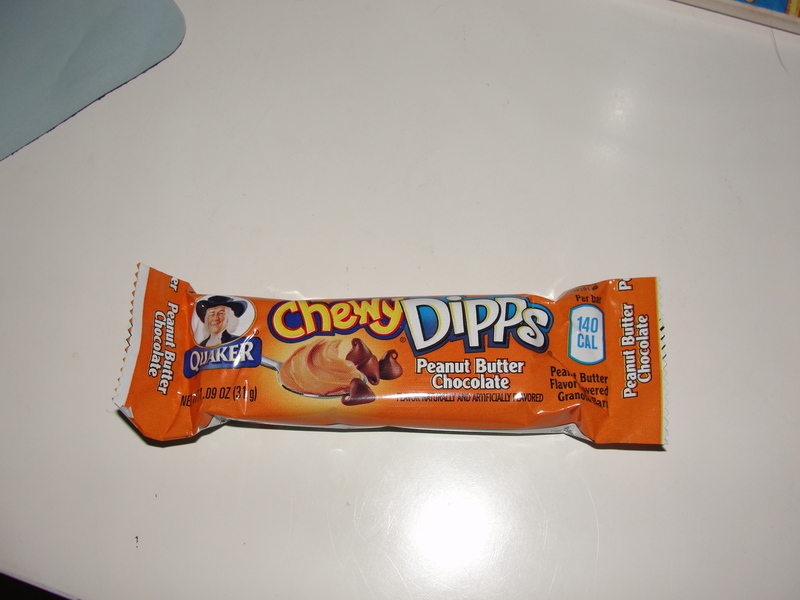 I was so excited when I saw the Chewy Dipps Peanut Butter Chocolate bar. Of course, I grabbed a box and was thrilled to try them. And of course, it was A Chewy Let Down. My thought was that this bar would be covered in a lovely peanut butter with a chocolate granola bar core. Or, at least this was the thought I formulated after reading the package. My first indication that this would not be good was when I opened my first bar. I found the smell of fake, pseudo peanut butter to fly from the package and hit me like a ton of bricks. I figured, “Okay…I am over thinking this.” I have a tendency to stress about everything and this was no different. I decided it was time to just break off a piece and find out the true verdict. And, if you couldn’t already figure it out, the true verdict was a Let Down. That fake, pseudo peanut butter smell I smelt? Yeah, that is exactly how it tasted. Not only did the peanut butter covering have a funky flavor, it also had an odd consistency. While it was not creamy like peanut butter usually is, it was also not hard. It was some where in between, hanging in limbo, just trying to find itself. 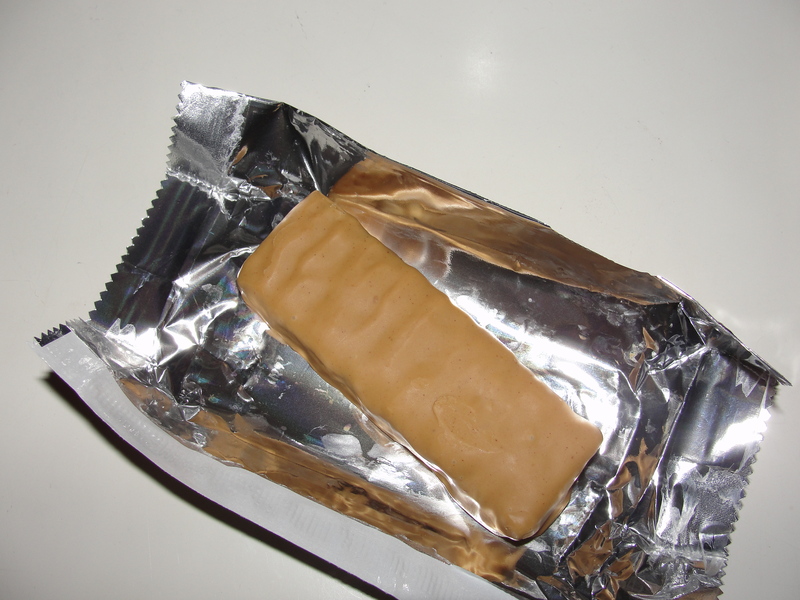 After I ate half the bar, I stuck it in the fridge for 10 minutes or so. While this did help the consistency – it was made a bit harder – the flavor could simply not be helped. All I could taste was an overload of sugar and peanut flavoring. This was in no, way, shape, or form, peanut butter. 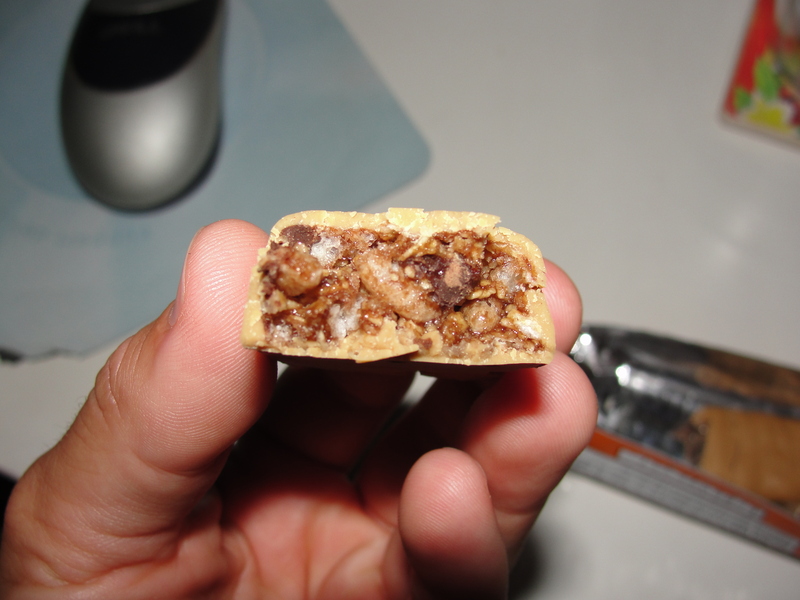 As for the chocolate granola bar core…it was really no better. The fake peanut butter taste was so overpowering that the granola bar had trouble standing on its own. Indeed the consistency was as it should be but, the flavor was just not there. And if it was, it was hiding far too much to be noticed. If I was blindfolded and eating this, I would have no idea that it was a chocolate granola bar. It is really hard to say much else about the flavor since, I simply could not taste it. I finished this bar but, have had a problem finishing the box. The box only contained 6 bars yet, I have another 2 to finish. I even went back and tried another, this time after leaving it over night in the fridge, and the results were no better. I don’t think I will stop buying the BOGO Chewy Bars but, I know for certain that I will never again buy the Dipps Peanut Butter Chocolate variety. If you are in the mood for overly sugary, peanut butter flavor, weird consistency granola bar…grab a box. Otherwise, avoid this Chewy Let Down at all costs.